Figure 4.3: Ionization fractions are plotted against the number density . 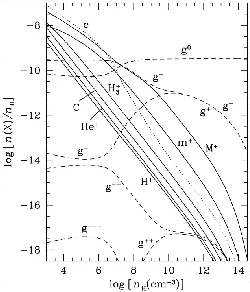 The ionization rate of an H molecule by cosmic rays outside the cloud is taken . 20% of C and O and 2% of metallic elements are assumed to remain in the gas phase and the rest in grains. where the numerical factor .